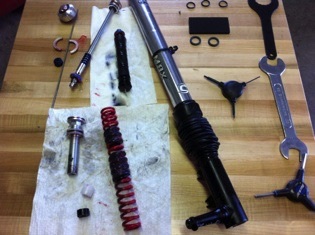 Lefty and Headshock Overhaul- Like any shock on the market, these shocks need their oil changed and seals replaced. We remove the oil cartridge and rebuild it with all new seals and oil. We also clean and relube the air chamber. We inspect telescope bearings and reset them to original position. We inspect the boot and replace if needed. Shock Overhaul- Shock manufacturers highly recommend regular maintenance on their products. This includes oil changes, seal replacement, and in extreme cases, bushing replacement. We have many of these small parts in stock, and if we don’t we can special order the exact parts we need and make your shock feel like brand new and make it last longer. 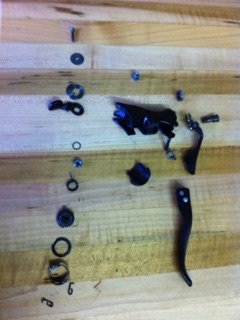 Ergo Lever Rebuild- For those Campy users out there, we have plenty of experience rebuilding Ergo levers. 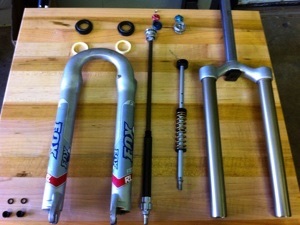 One of the great features of a Campy lever is that it is almost entirely rebuildable. By replacing a handful of small parts, you will get the crisp, sharp shifting that Ergo levers are known for when they are brand new. Rear Pivot Rebuilds- Full suspension bikes take a beating and over time the rear pivots will develop tiny bits of play that cause the rear end to feel loose and sometimes make a knocking noise. By replacing bushings and spacers around the shock, we can eliminate any play in the rear end and make for a quieter ride. Hydraulic Brakes- Manufacturers of some of the best selling hydraulic brakes on the market are recommending that the brakes be bled once a year so that new fluid is in the system.